To the uninitiated, ice fishing seems improbable, wacky, and dangerous. But every winter, more than 2 million hardy northerners go to their place on the lake: literally on the lake. Striking story-telling photographs by Layne Kennedy and engaging essays by outdoor writer and fisherman Greg Breining capture the quirky world of ice fishing - its natural beauty and solitary subzero vigils, along with its oddball practices and practitioners.Kennedy and Breining take readers to fun-filled if bizarre festivals that include 'Guys on Ice' in Door County, Wisconsin, the Tip-Up Town USA festival on Michigan's Houghton Lake, and the supremely self-mocking International Eelpout Festival on Minnesota's Leech Lake, which honours a slimy, pot-bellied, finny critter. Photos offer peeks inside ice houses that range from a plastic-bag cocoon to an impossibly luxurious Adirondacks ice residence with front porch and wet bar. Travel to a frozen lake in the Boundary Waters, to ice cities that form and disband overnight, and to the Volga River near Moscow, shadowed by the KGB. 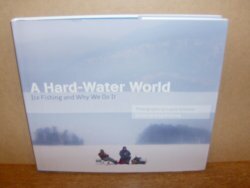 Perhaps most importantly, "A Hard-Water World" allows the reader to enjoy the beauty, wonder, and, yes, insanity of ice-fishing all year round and in the comfort of his or her own home. 127pp.